Ted Williams' Mom: "God Has Answered My Prayer"
Ted Williams, the homeless man with the pitch-perfect voice found panhandling on the side of an Interstate highway ramp in Columbus, Ohio, apparently won't be homeless - or jobless for long. He was spotted by a reporter, who made a video of Williams that went viral on YouTube, attracting three million hits. Then, he appeared in an exclusive interview on "The Early Show" Wednesday. And he's been inundated with job offers ever since. But his biggest wish is - to reunite with his 90-year-old mother, Julia Williams, who's back in Brooklyn, where he grew up. And Ted flew to New York to finally see his mom again. "Early Show" co-anchor Chris Wragge accompanied Julia on her way to LaGuardia Airport for the anticipated reunion. "I'm very proud of him. I hope that he can do good," she told Wragge. She hadn't seen Ted in more than ten years, and was overjoyed at the thought of laying eyes on him again. But the reunion was scuttled when another media outlet whisked Ted away. Still, in an exclusive interview on "The Early Show" Thursday, Julia told Wragge, "It was alright" that she didn't get to see Ted at the airport. "I wanted to be there when he got off the plane," she said, "but I wasn't. But it's alright." Williams also told Wragge, "God has answered my prayer. I prayed that I would live to see this time when he would do well." 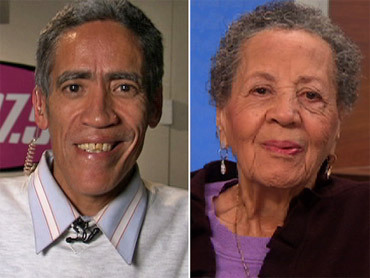 In the Wednesday "Early Show" interview, an emotional Ted Williams said, "My mom is just really.. I.. I… I'm going to be going to New York, hopefully this afternoon, and please… I apologize if I am getting a little emotional. I haven't seen my mom in, in great deal of time. … But she doesn't believe (my good fortune now). … One of my, one of my, my biggest prayers that I … sent out was that she would live long enough for me to, you know, rebound or whatever. And I guess God kept her around, and he kept my pipes around, you know, to, to maybe just have one more shot..."
Afterwards, the Cleveland Cavaliers of the National Basketball Association called to offer Ted a job - and a house. The NBA"s New Jersey Nets called "The Early Show" seeking to get in touch with him. Even Hollywood came a-calling. YouTube hits zoomed past the nine million mark, and this website's visits soared as people sought to see the Ted Williams interview.